The tours to Petra and Wadi Rum that we offer are definitely the best choice that you can make, and we let the testimonials of our clients in TripAdvisor and YouTube to speak in our behalf. Our uniqueness is in the high level of personal service that we offer to our clients, and the careful attention to all the little details that make each and every Petra and Wadi Rum Tour to a perfect trip and a great experience. Starting from our professional representative in Eilat, who will pick you up from your accommodation and offer you as a gift fruits of the season; to our professional representative in Jordan, who will wait for you right at the entrance to the border, and take you to your professional tour guide from our selective team of experts; continue to the carefully planned tour itinerary and superior hand-picked restaurant and hotel; and lastly with our representative in Eilat, who will wait for you after the tour to take you back to your accommodation, and give you a personalized souvenir. No tour to Petra is complete without visiting Wadi Rum, which is known by its amazingly beautiful landscapes. We take you to a deluxe Bedouin camp in Wadi Rum. You will enjoy a welcoming Bedouin hospitality, and a very tasty special Bedouin dinner that is cooked under the sand (Zarb). You are promised to have a great fun! The accommodations in the Bedouin camp are in modern tents with real beds and clean sheets, and most importantly – the staff is very friendly and welcoming. You will finish your trip with a jeep safari in the beautiful landscapes that Wadi Rum nature reserve has to offer. Adding a tour to Wadi Rum to your Petra Trip gives you the best value for your money. We invite you to select and book with us the best tour to Petra and Wadi Rum that suits you from the wide variety of tours to Petra and Wadi Rum that we offer. You are also welcome to contact us with any question that you might have. Our team of experts is ready to assist you online, on email, phone, chat, Skype, Messenger, WhatsApp, Viber and Telegram. Don’t compare 🍏 apples with 🍐 pears! 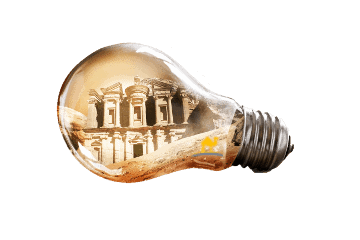 Our Petra trips are the best value available, based on our great prices without ever compromising on quality. Pick-up from your hotel in Eilat. Free mineral water in the bus. View point of Wadi Rum from the main road. Short horseback riding for the first 600 meters of the route. Lunch at a superior local authentic restaurant in Petra. Entrance fees to Wadi Rum. Accommodation at a premium Bedouin camp in Wadi Rum on HB basis. Jeep safari tour in Wadi Rum nature reserve. Free time in the market of Aqaba. Transfer back to your hotel in Eilat. Free souvenir and Jordan brochure. Entrance fees to Petra for 2 days. 3-star hotel in Petra on HB basis. Free time to explore Petra on the second day. 3-star hotel in Aqaba on HB basis. Light breakfast with juice and free mineral water. Private guided tour in Petra. Panoramic city tour of Aqaba (if time permits). Private transfer to Wadi Rum. Accomodation at a premium Bedouin camp in Wadi Rum on HB basis. Extended jeep safari in Wadi Rum nature reserve. BBQ lunch in the middle of the desert.